Ilgar Gurbanov is Research Fellow at the Center for Strategic Studies of Azerbaijan. Following the government change in Armenia with the overthrow of previous regime composed of so-called “Karabakh Clan”, there are fresh hopes for a result-oriented dialogue to achieve peaceful resolution of the Nagorno-Karabakh conflict, which is one of the longest protracted conflicts in the EU’s eastern neighbourhood. In last December, Azerbaijan’s President Ilham Aliyev tweeted that “The year 2019 will give a new impetus to the Armenia-Azerbaijan Nagorno-Karabakh conflict settlement process”, and “the only way for the new Armenian leadership to carry out all their plans on transforming the country is to resolve the conflict with Azerbaijan”. Armenian Prime Minister Nikol Pashinyan tweeted in parallel that “Peaceful resolution of Nagorno-Karabakh conflict remains top priority for us”. The optimistic narrative of the head of states was followed by Azerbaijan’s Foreign Minister Elmar Mammadyarov’s statement anticipating “certain progress” to be made in 2019 “for withdrawal” of Armenian armed forces from Azerbaijan’s occupied territories and “the normalization of relations”. He expressed Azerbaijan’s readiness to assure security of Nagorno-Karabakh Armenians by granting them the highest self-determination right within Azerbaijan’s “internationally-recognized borders”. The recent statement of Tural Ganjaliyev, Chairman of Azerbaijani Community of Nagorno-Karabakh region, “to carry out a constructive dialogue” for peaceful reconciliation with the Armenian community, is another sign of will for resumption of inter-community confidence-building. The previous Armenian government under Serzh Sargsyan’s rule, in contrast, did not encourage establishing such a dialogue. Furthermore, the UN General Assembly adopted a resolution put forward by Azerbaijan titled “Missing Persons” urging to take necessary measures to search for missing persons in the armed conflict. Armenia, whereas, hitherto has rejected the releasing of prisoners of war and hostages according to the “all-to-all” principle, so this development could be a first positive stage in terms of generating a bilateral trust. 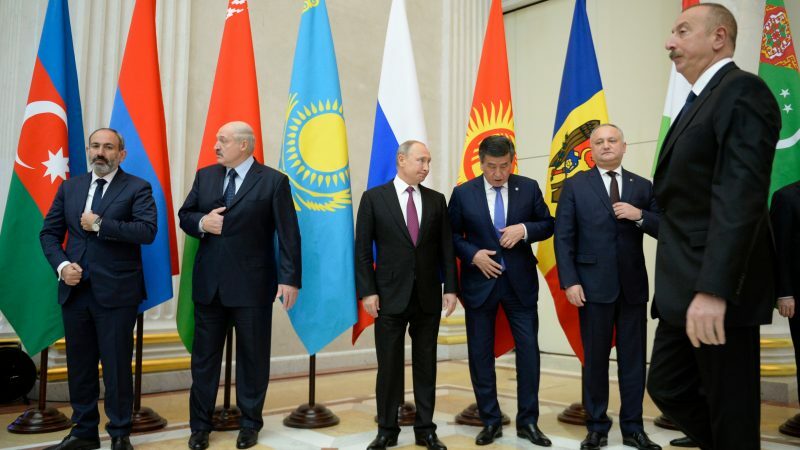 At the CIS’s meeting of Heads of States in Dushanbe in September 2018, President Aliyev and PM Pashinyan agreed to create the necessary conditions for communication between two sides to be conducted at lower working levels when necessary. At the latest OSCE’s Ministerial Council meeting in Milan, Azerbaijani and Armenian foreign ministers agreed to work for peaceful conflict settlement including preparing the population for peace. Afterwards, FM Mammadyarov said that “with my Armenian counterpart, we reached a mutual understanding for the first time after a long time”. The general positive trend was endorsed, albeit in declaration, by the OSCE Minsk Group’s co-chairing states too. Russian Ambassador to Azerbaijan Mikhail Bocharnikov stated that a more favourable atmosphere for the conflict settlement will be created in 2019. During his visit to Armenia, the US’s national security adviser John Bolton highlighted the importance of finding an agreement for the conflict conditioning that “once that happens, then the Armenian-Azerbaijani border would open”. Former US Ambassador to Armenia Richard Mills at the end of his tenure said that “any settlement is going to require the return of some portion of the [Azerbaijan’s] occupied territories.” That sends a clear message to new Armenia government that the latter will not be able to delay indefinitely the de-occupation of Azerbaijani territories. Moreover, the protection of the northern frontier posts of Azerbaijan-Armenia state border has been handed over to Azerbaijan’s State Border Service, while the opposite side of the borderline is guarded by Armenia’s police detachment. Although Azerbaijan’s decision was reportedly aimed at further improving the Defence Ministry’s military units’ combat capability, the partial deployment of paramilitary forces from both states implies a reciprocal confidence-building attempt to reduce the ceasefire violations at the borderline. Azerbaijan, however, does not disregard the security considerations. President Aliyev had noted his country’s will to settle the conflict peacefully, based on international norms including the territorial integrity principle and the UN Security Council’s resolutions. However, he also pledged to boost Azerbaijan’s “military power” justifying that the military potential “plays a special role” for the conflict resolution. In 2018, Azerbaijan and Armenia conducted large-scale military trainings aimed at boosting their troop’s readiness for real war situation, and both Baku and Yerevan ramped up their military budgets for 2019. Apart from investing in domestic military industry, Azerbaijan continued supplying its military with cutting-edge and advanced arsenal. While Azerbaijan shifted away its reliance from a single arm-supplier toward multiple defence partners, Armenia retained its overwhelming dependence on Russia’s military/arms support. Azerbaijan’s ambition to boost its military capability is associated with scepticism regarding Armenia’s voluntary withdrawal from the former’s occupied territories through diplomatic negotiations. During the first Karabakh war, the then Armenian authorities procrastinated with so-called “diplomatic negotiations” while the country’s troops were advancing the area of occupation in Azerbaijan’s territories. Moreover, Armenia’s evolving military doctrine from “static defence” to more “active deterrence” strategy is fuelling mistrust in Baku on the true nature of Yerevan’s intentions. Therefore, Azerbaijan prioritizes the constant readiness of the armed forces for possible counter-operations and maintains vigilance by consolidating its military positions prior to any possible Armenian provocation. In April 2016, Armenia’s military provocation resulted in four-day fights, leaving a significant victory for the Azerbaijani side, with the latter’s counter-attack liberating from Armenian military control some strategic portions of its occupied territories. The protraction of the status quo in the conflict zone and the lack of efficient international mechanisms to force Armenia into substantive negotiations embolden the conflicting parties to bolster their military capabilities. But the status quo is not on the side of the peace process. Therefore, the “diplomatic optimism” should be translated into the constructive engagement for a genuine settlement process to spawn a sustainable peace. Azerbaijan patiently waited for the completion of domestic political turbulence in Armenia in order to negotiate with a legitimate government and achieve concrete results. Before the parliamentary elections in Armenia, Pashinyan prioritized consolidating his power by crushing domestic opponents, and did not focus much on Karabakh topic which is a delicate issue within Armenia since any settlement would imply certain compromises from their side. To what extent the Pashinyan-led government would change Armenia’s traditional stance radically toward compromise is an open question. To start with, the new leadership in Yerevan must acknowledge that the “Karabakh” card played by the previous Armenian government led them to nowhere.